I know. I’m a little late to the Super Broly review party. But I finally got around to seeing “Dragon Ball Super: Broly”, and I thoroughly enjoyed it. My wife wanted to go see the movie “The Wife”. And I had zero interest in seeing “The Wife” with the wife. 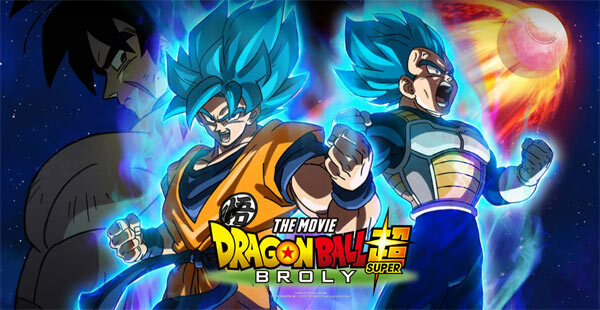 I saw that the local AMC movie complex was showing both “Super: Broly” and “The Wife” at similar showtimes, so my wife and I walked into the AMC together, and parted ways to our own theatres. Perfect! We went to a weekday matinee … kids were in school … and I literally had the entire theater to myself. Sweet! No disturbances! Dragon Ball Super: Broly is 1 hour and 40 minutes long, and I loved all 100 minutes of it. Some of the DBZ movies start off slow. Dragon Ball Z: Resurrection F had a brutally slow start, but had a great finish. 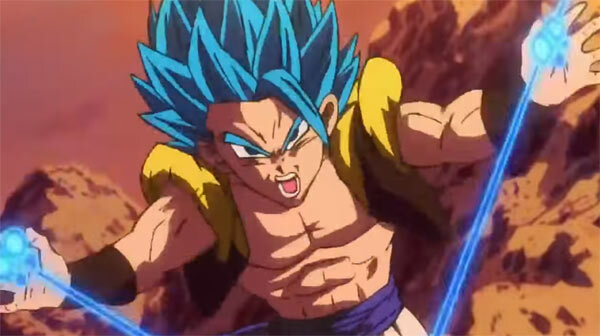 DBS: Broly is excellent from start to finish. The movie opens on Planet Vegeta when Vegeta and Broly are both infants, and in their baby-birthing pods. Goku has not been born yet. These early scenes are taking place before the events in Dragon Ball. King Cold, Prince Frieza and the Ginyu Force come for a not-so-friendly visit. The Saiyans are already working as slaves for King Cold when the movie starts. King Cold informs King Vegeta that he (King Cold) is retiring, and the Saiyans will be working for Frieza now. Frieza is a bratty, impatient young creature who kills a few Saiyans for fun during the visit. Frieza leaves the Saiyans with some new/improved Scouters so they can continue to conquer planets for him. These new 4-digit scouters go slightly beyond 9000! After Cold and Frieza leave, King Vegeta goes to visit his son in his birthing pod. King Vegeta is sure that Prince Vegeta will grow to be the most powerful Saiyan in the universe someday. Vegeta is in a Pod room with other Saiyan babies. The doctors there use their new scouters to check out all the babies’ power levels. Broly is in the room too, and Broly’s power level is crazy high … much higher than baby Vegeta’s. King Vegeta is pissed that Broly possesses such a tremendous power level, and he launches baby Broly in a space pod to a distant planet called Vampa to get rid of him. Broly’s father, Paragus, is now super pissed at King Vegeta. 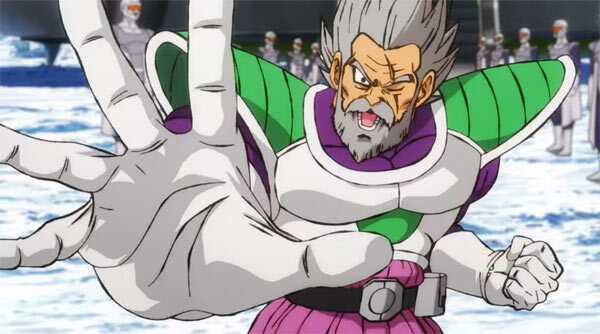 Paragus vows vengeance on the Vegetas, steals a spaceship, and tracks down his son. Paragus crash lands his ship on Planet Vampa. His ship is destroyed. He finds his son, but now they are both stuck on Vampa having to brave the planet’s tough conditions of wind, giant beasts, and arachnid monsters. Frieza learns about the Legend of the “Super Saiyan Warrior”. 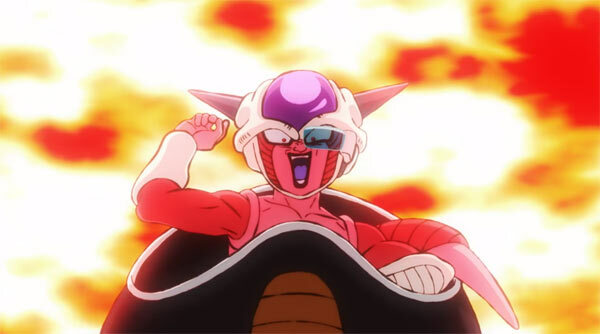 Frieza feels that if kills all the Saiyans, he can prevent any Saiyan from becoming a Super Saiyan and killing him. So Frieza calls all the Saiyan Slaves back to their home planet. Bardock, Goku’s father, smells that something rotten is about to go down on Planet Vegeta. Bardock thinks Frieza is going to exterminate the Saiyans. Bardock steals a space pod and launches Goku to earth in order to protect his son. You can watch the original Dragon Ball series to find out what happens to Goku after that. Vegeta, Nappa and Raditz are young kids working as Frieza’s slaves on a distant planet and choose to ignore Frieza’s call to assemble. Thus, their lives are spared. Their story picks up in Season 1 of Dragon Ball Z.
Frieza does indeed destroy Planet Vegeta in an attempt to destroy the Saiyan Race. Vegeta, Raditz, Nappa, Goku, Broly and Paragus are basically the only Saiyans now alive, as they are all on other planets. Some other Saiyans survived in other movies, but that doesn’t matter in this Super Broly movie. Cut to Present Day …. So, what’s happening in present day? Goku, Vegeta, Bulma, Beerus, and Whis are all happily living on a small island where they can spar and train without harming the rest of earth. We learn that Bulma has secretly assembled 6 of the 7 Dragon Balls in order to make herself look 5 years younger. Kid Trunks contacts Bulma via her Smartwatch and tells her that some of Frieza’s henchmen have broken into her lab and stole the 6 Dragon Balls. Goku, Vegeta, Bulma and Whis decide to head off to get the 7th Dragonball before Frieza gets it. They figure Frieza is going to do something evil with it. Cut to Frieza. We learn that Frieza’s evil plan is to make himself 5 centimeters taller. He wasn’t actually planning anything evil just yet. Cut to two of Frieza’s low-class, but actually likeable, henchmen “Cheelai and Lemo”. 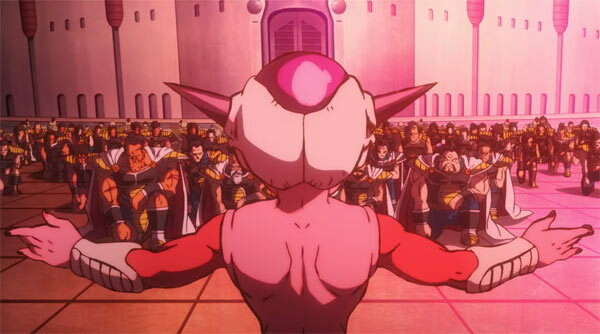 They are using scouters to find recruits for Frieza’s army. They discover 2 people living on Vampa (Broly and Paragus). Cheelai and Lemo rescue Broly and Paragus and take them to Freeza’s ship. Paragus informs Frieza that Broly is a fierce warrior. Paragus has created a custom shock collar and shock remote control for Broly because Broly can go absolutely mental while fighting, and shocking him will reel him back in. Paragus says that Broly will basically go into Saiyan-Ape-Mode without actually turning into an ape, and that Broly will be uncontrollable. Paragus tells Frieza about their needed vengeance on Vegeta, and Frieza is happy to oblige them. Cheelai hates the fact Broly has a shock collar on. Cheila steals the shock remote and destroy it. Now there will be no way to reel Broly back in if he goes full-on ape-mode! Frieza concocts a plan to have Broly destroy Vegeta on Earth while Frieza collects the 7th Dragon Ball and wishes for his taller stature. After that, Frieza hopes to defeat Goku without Vegeta’s interference. Let the typical, Awesome, DBZ Fighting Commence! Everyone arrives at the 7th Dragon Ball at the same time, and the fighting ensues. 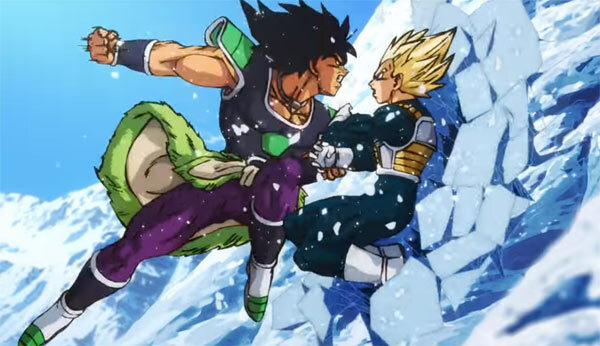 Vegeta fights Broly. 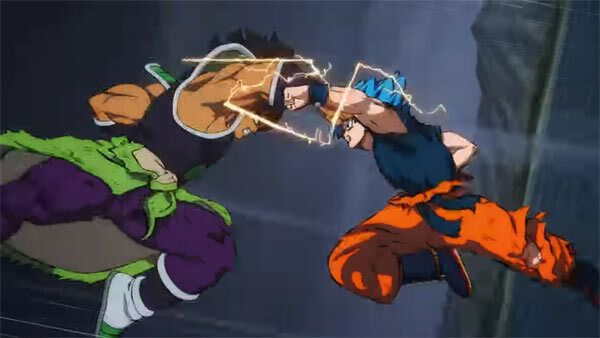 Goku fights Broly. Broly learns he can evolve, and goes Super Saiyan. Eventually, even Golden Frieza fights Broly. Goku and Vegeta even do the fusion technique. Shenron appears. It’s all great fun. Whereas Goku and the Z Warriors would fight someone like Frieza for 20 episodes in Dragon Ball Z, the movie producers have to cut all the fighting down to like 40 minutes or so. So the fighting is fast, furious and thrilling. It’s very rushed, but you understand why. As I mentioned above, I loved this movie. It was fantastic from start to finish. The animation is phenomenal, and looks amazing on the big-screen There’s very little original Dragon Ball type cutesy-silliness in this movie. We get a good backstory/history on Broly and the evilness of Frieza. Broly is a crazy strong fighter, but raw. The fight scenes with Vegeta, Goku, Broly and Frieza are as awesome as any DBZ fan can hope for. 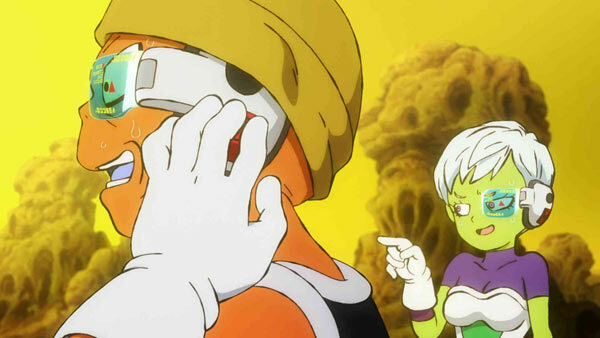 Piccolo even makes an appearance, but none of the other Z Warriors are seen or mentioned. If you’re a DBZ fan, and haven’t seen this movie yet, I highly recommend it. It’s not very often we get Dragon Ball on the big screen, and I strongly suggest you get to a theater before it disappears to DVD.